Pauline Wickham wrote this reminiscence about her family's immigration to Nebraska and later Kansas from Germany. She writes that she was born in Frankfort, Nebraska. The Floeders moved from Nebraska to Leavenworth and later Wichita. Pauline describes the trip from Leavenworth to Wichita in approximately 1870. She includes a graphic description of the damage done by grasshoppers in 1873. The reminiscence describes some interaction with cowboys since they lived near the routes of the cattle trails. 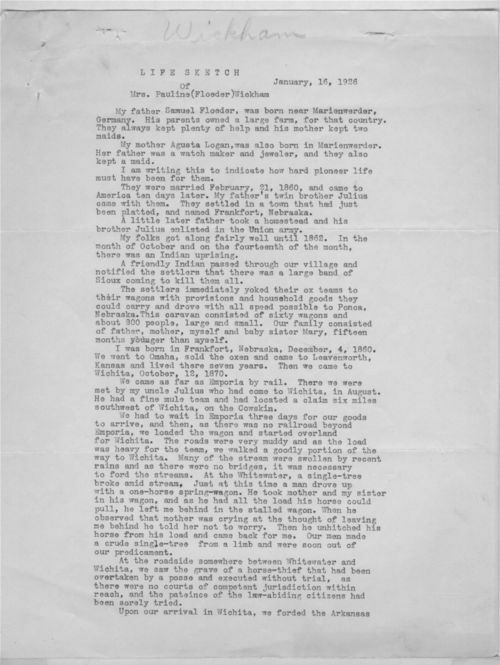 This story was written as part of the efforts of Lilla Day Monroe to collect reminiscences concerning the women's perspective in settling Kansas. Mrs. H. H. Motter, Wichita, contributed the story to the project though it was written by Mrs. Wickham.